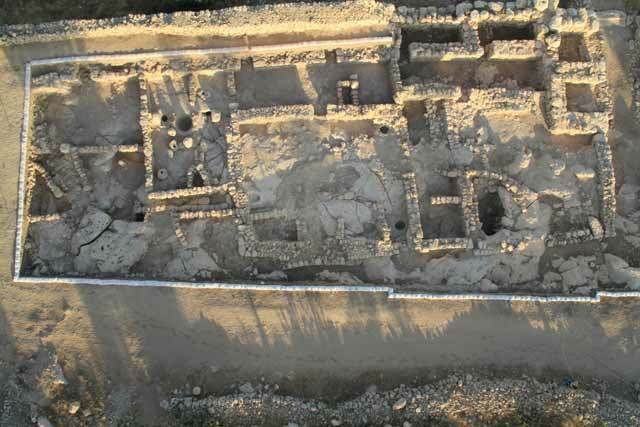 In 2008 I first ran a story about a major archaeological discovery at Khirbet Qeiyafa. The Israeli Antiquities Authority is releasing the preliminary report of the finds at Khirbet Qeiyafa. As I explained then, the findings are challenging skeptical scholars' claims. As I explained then, according to skeptical scholars the accounts of the kingdoms of David and Solomon are myths--essentially the Israelite equivalent of Arthurian legends of Camelot and the Roundtable. In short, in their view, it was simply fabricated. After Israel's Babylonian exile, the Jewish leaders invented these stories. The Israelites simply "idealized" their past; the Davidic traditions are little more than imaginary political propaganda. Perhaps, such scholars might concede, there were some tribal leagues and small villages, but certainly no significant civilization amounting to a kingdom. The report of what has been found at Khirbet Qeiyafa is calling such skepticism into doubt. 1. A town plan characteristic of the Kingdom of Judah that is also known from other sites, e.g., Bet Shemesh, Tell en-Nasbeh, Tell Beit Mirsim and Be’er Sheva‘. A casemate wall was built at all of these sites and the city’s houses next to it incorporated the casemates as one of the dwelling’s rooms. This model is not known from any Canaanite, Philistine or Kingdom of Israel site. 2. Massive fortification of the site, including the use of stones that weigh up to eight tons apiece. 3. Two gates. 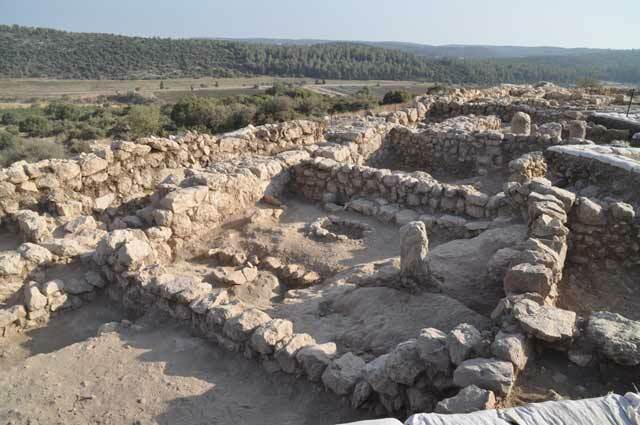 To date, no Iron Age cities with two gates were found in either Israel or Judah. 4. An open space for a gate plaza was left near each gate. In Area C an area was left open parallel to three casemates and in Area D, the area was parallel to four casemates. 5. The city’s houses were contiguous and built very close together. 6. Some 500 jar handles bearing a single finger print, or sometimes two or three, were found. Marking jar handles is characteristic of the Kingdom of Judah and it seems this practice has already begun in the early Iron Age IIA. 7. A profusion of bronze and iron objects were found. The iron objects included three swords, about twenty daggers, arrowheads and two spearheads. The bronze items included an axe, arrowheads, rings and a small bowl. 8. Trade and imported objects. Ashdod ware, which was imported from the coastal plain, was found at the site. Basalt vessels were brought from a distance of more than 100 km and clay juglets from Cyprus and two alabaster vessels from Egypt were discovered. The excavations at Khirbat Qeiyafa clearly reveal an urban society that existed in Judah already in the late eleventh century BCE. It can no longer be argued that the Kingdom of Judah developed only in the late eighth century BCE or at some other later date. Sounds like it's doing a lot more than that! It sounds like it's pretty much removed what little basis that skepticism had, so that the best you can really say in favor of the "David myth" idea is that it's possible to imagine that's it's true. Thanks for calling our attention to this, Michael. Ziony Zevit was calling for a return to the writing of ancient Israelite history at the last SBL, and finds like this support his position. Went back and read the 2008 post that you linked to, with the additional information there (eg that this fortress is on a key strategic site protecting the road to Jerusalem and so indicates a major centralized power there, the writing, the lack of pig bones, the possible identification with Sha'arayim, etc). Wow! It seems like in minimalist circles, the fact that a Biblical account asserts that something happened is not just disregarded, but actually taken as evidence that it didn't happen, and even though this should mostly settle the issue even apart from the Biblical record, the observation of a major urban fortress from the Davidic period has to be weighed against the "evidence" that there was no kingdom because the Bible says there was. But, on the bright side, as John Hobbins pointed out, this dig probably would've never happened if it hadn't been for them. Btw, any updates on what's in the writings at the site? I saw that Barnea Levi Selavan described them as "proto-Canaanite Hebrew." What does that mean exactly, and what's the word on what they say? I am pleased to get this details, I just wanted you to thank for your time and for this wonderful read I Throughly enjoy every bit of it and love to bookmarked this to check out new stuff of your blog a must read blog!!! !